A police investigation has been launched after a death threat aimed at controversial Bradford West MP George Galloway was sent to the Houses of Parliament. Officers from the Palace of Westminster contacted the Metropolitan Police's Counter Terrorism Command following the receipt of the letter on Monday. According to a source, the letter included a threat that the Respect Party MP would "die from a deadly virus". Scotland Yard said the letter was being treated as "malicious communications" but the force did not name the MP it was intended for. "Officers from the Palace of Westminster contacted the Met's Counter Terrorism Command on Monday, September 15 following the receipt of a letter intended for a member of the House of Commons. This letter is being treated as malicious communications. No arrests have been made. Inquries are ongoing." Writing on Twitter, Mr Galloway said he was grateful to police and staff in the post room at Parliament who were "the ones endangered". On Monday the pro-Palestine MP for Bradford West was speaking at a No campaign rally in Glasgow ahead of the referendum on Scottish independence. 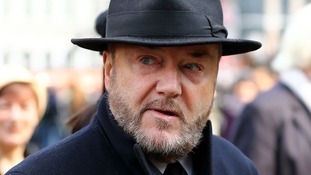 Last month Mr Galloway was badly injured after he was attacked in the street in Notting Hill, west London. He had earlier been interviewed by West Yorkshire Police following a speech in Leeds in which he claimed Bradford was an Israel-free zone.